View a detailed showcase of this award-winning series, explaining the outstanding features and benefits. 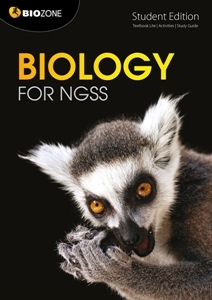 Biology for NGSS has been specifically written to meet the requirements of the Next Generation Science Standards (NGSS) for High School Life Sciences (HS-LS). It is a hybrid resource that's part textbook, part study guide and part activity book all rolled into one. We use an infographic style of presenting information, with annotated diagrammatic explanations. Our program and pedagogical approach requires learners to apply what they've learned in a previous activity to a new situation, not merely recall data. It's an enquiry-based approach. Biology for NGSS encompasses all dimensions of the standards ( Science and Engineering Practices, Crosscutting Concepts, and Disciplinary Core Ideas), addressing the program content through a wide range of engaging student-focused activities. Through completion of the activities, students build a sound understanding of science and engineering practices, recognize and understand the concepts that link all domains of science, and build the knowledge base required to integrate the three dimensions of the standards to meet the program's performance expectations. Download our free classroom guide which assists in the best use of Biology for NGSS and its features. We have received excellent customer feedback from the REVERE Award-winning 1st Edition. This has enabled us to polish and refine this resource for the new edition. The second edition has been revised to improve its usability through better communication of the three dimensions of NGSS. Tabs identifying specific Science and Engineering Practices and Crosscutting Concepts allow these to be more easily identified within and between topics. This systems allows students to easily make important conceptual connections throughout the program. Crosscutting Concepts are now addressed alongside Science and Engineering Practices and DCIs in each chapter introduction, mapping the integration of these to specific activities. New activities have been included throughout, providing a wider range of tasks and experiences and greater opportunity for students to engage in science practices and for assessment. Two new chapters: Natural Selection and Adaptation, and Biodiversity and Humans are part of this revision of content. The Disciplinary Core Ideas (DCIs) provide the structural framework for the book, dividing it into four sections, each prefaced by a concept map. Each chapter provides activities to specifically address the performance expectations arising from the DCIs. Science and Engineering Practices are supported throughout with activities designed to develop competence in all aspects of the eight practices. A supporting introductory chapter provides students with additional opportunities to establish many of the mathematical and inquiry-based skills that they will employ throughout the book. Crosscutting concepts are identified throughout, allowing students to make connections between core ideas in different domains of science. Nature of Science: Students develop an understanding of the nature of science through incorporation of its basic principles into activities. Where appropriate, detail is provided in key boxes so that students can better understand both the concepts and practices of science. Engineering Design: The Engineering Design component of NGSS has been incorporated as appropriate through activities that engage the student in the solution of real world problems. This aspect of the standards provides an exciting opportunity for students to apply their knowledge in a creative way, with due consideration to social and environmental considerations. Specifically designed to address the content and aims of the Next Generation Science Standards for HS-LS. Activities are specifically designed to address the content and aims of the Next Generation Science Standards for HS-LS, and to connect Engineering, Technology and Applications of Science to DCIs sharing the same performance expectations. Students are encouraged to apply their understanding to developing creative, feasible, and ethically responsible solutions to real world problems. The HS-LS DCIs provide a structural framework that is both easy to follow and allows integration of activities addressing the required Science and Engineering Practices. A clear coding system identifies Crosscutting Concepts as they apply throughout, making clear linkages between related concepts in different topic areas and different domains of science. Activities designed to meet the science practices requirements at high school level are identified at the beginning of each chapter. These are easily identified using the tabs at the bottom of the activity pages. Each chapter is prefaced by a one-page synopsis of core ideas, science and engineering practices, and key terms, providing a summary of learning outcomes. Each activity opens with a key idea, which summarizes its primary focus and provides a clear take-home message for the student. A direct questioning style helps students to easily identify what is being asked. A wide range of tasks, including free response, data analysis and presentation, and interpretation and evaluation of evidence, scaffold student learning in a way that simultaneously builds confidence and competence. End of chapter synoptic activities provide a means of self-testing or assessment. They focus on the understanding of content and vocabulary. Concept maps encourage connections between topics and promote recognition of crosscutting concepts. ► Who should use "Biology for NGSS"? Biology for NGSS has been written specifically for the High School Life Sciences component of NGSS (grades 9-12). The language used and assumed prior knowledge are appropriate to these grade levels. However, this resource will find a good fit with many regular biology programs undertaken by non-NGSS states. ► How is the book structured? The book is structured on the four Disciplinary Core Ideas and divided into 4 sections, each prefaced by a concept map indicating the content coverage and crosscutting concepts. ► How do you address Crosscutting Concepts? There are two student-friendly ways to address crosscutting. The tab system at the bottom of each activity page makes connections to topics that are related, look at the same principles in a different way, or build on prior knowledge. Each chapter is also prefaced with a concept map showing the structure of the section. Students can use this as a visual prompt to make their own connections. Similarly, a map at the beginning of the book encourages crosscutting across the entire program. The Classroom Guide for teachers will provide crosscutting to other science strands in NGSS. ► How have you addressed Science and Engineering Practices? Science and Engineering Practices are integrated throughout the book and are a fundamental part of its structure. There is a wealth of activities requiring the analysis and interpretation of secondhand data, development and use of models, and critical evaluation of evidence-based examples. Students are encouraged throughout to use and develop their critical thinking skills to explain results and create solutions to problems. At the request of teacher feedback, we have also provided an introductory chapter covering basic skills in science, particularly data handling and analysis. ► Have you catered for the Physical Science (PS) and Engineering Design (ETS) components? PS and ETS components applicable to the HS-LS components of NGSS are clearly identified in the relevant chapters, and the performance expectations for those components are met through activities within those chapters. ► Do I need to buy a textbook as well? 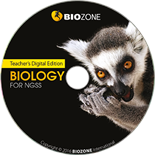 You may wish to use Biology for NGSS with a standard text, or use the other varied resources at your disposal to expand on the program offered by the book. We have found some teachers like to retain the use of their textbook as a reference for accelerated students, whereas others find a textbook isn’t necessary. Some teachers have suggested that our book becomes the hub of their teaching program and have dispensed with purchasing expensive textbooks. ► How do I use this book effectively in the classroom? The book is highly modularized and the program offered is adaptable to many different pedagogical styles. It is perfect for classroom-based work, set work during teacher absence, homework, and self-study. A full explanation of how to use the book to best effect, especially in a differentiated classroom, is provided in the Classroom Guide for teachers. ► I want to order. How do I go about it? You can place an online order using your credit card, submit an official purchase order via our website or download and fax/email through our order form. If you have any questions or queries regarding placing your order, please do not hesitate to contact our friendly sales team at sales@biozone.co.nz. ► My state has not adopted NGSS. Can I still use this product with my state-specific curriculum? Although branded as an NGSS curriculum title, this resource will find a good fit with many regular biology programs undertaken by non-NGSS states. ► How do I provide feedback about this product? We would love to hear your feedback about any of our products. Please submit your feedback to feedback@biozone.co.nz. ► How can I provide a testimonial for this product? We gratefully receive any testimonials for our products. Please send your testimonial to testimonial@biozone.co.nz along with your name and school (if desired). Please note that by submitting your testimonial you agree to its use in marketing and advertising. You can also submit a product review directly, at the top of this page. ► I am a workshop leader. Can I use these products in my workshops and how do I go about this? Yes, absolutely. We are happy to supply sample product and promotional material for use in your workshop or Summer Institute. Some delivery charges may apply. Please register your interest here. ► Can you offer professional development in respect to this product? We are currently unable to offer professional development for our products. However, the Classroom Guide (free of charge with your school’s first order) provides very good guidance for using the book. We are currently planning the development of online training videos to assist with professional development for our products.